Your lil athlete can begin classes at age 3, as long as they potty trained and out of pull ups. 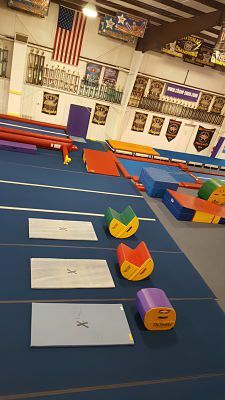 We teach tumbling classes for athletes up to 18 years of age. We take new students into class at any time, providing classes are not full. We have a 4 to 1 student to teacher ratio. These classes are limited to 12 students. Classes are an hour in length and the main focus is on tumbling skills. We begin every class with stretching and jumping. Throughout the class the athletes are spotted and also do drills to re-enforce proper tumbling technique. The class will also work on motion placement, chants and/or stunts at the end of class. The weekly hour long class is $40.00 per month. For athletes who already have a standing series of backhandsprings and round off backhandspring, we also offer an intermediate and advanced tumbling class. These classes are 45 minutes in length and cost $40.00 per month. The athlete will come 15 minutes early to the gym to warm up and stretch on their own. The class starts with tumbling rotations. Cheer Zone trains everything from the cartwheel all the way to the specialty passes that end with double fulls. We have the right class for every athlete! Please email us for further information at cheerzoneinc@hotmail.com. These small classes have 1 teacher working with 4 athletes. The class is focused on a teaching/cleaning a backwalkover, standing backhandspring or standing tuck. The athelte is spotted on the wedge or floor and also does drills to help with the skill between spots. These small classes fill up quickly and are great for perfecting new skills in time for cheer tryouts. Privates are 30 minutes in length. These classes are by appointment through the different instructors at Cheer Zone. You can find these instructors and their numbers on the bulletin boards in the hallway or by calling/talking to someone in the office. To take a private you must be enrolled in a class at Cheer Zone and account in good standing. Open gym is not a spotted class, come work at your own pace. There will be an instructor present to supervise, give corrections, and assist in any "warm up" spotting. Check back for open gym dates and times. Open gym is included with tuition for 2017-2018 Cheer Zone All Stars Competitive Team.